Festival with Dance, Music, Literature, Yoga and Food The World Culture Festival held in celebration of the 30th Anniversary of The International Art of Living Foundation will host 70,000 participants from over 150 countries who will take home unique sights, sounds, tastes and the mesmerizing variety of the world continents in one place! The Grand Celebration in the Olympiastadion Berlin as well as in the World Pavilions will showcase the beauty of all world cultures through dance, music, food, literature and conferences. The Festival will honour the norms and values of various cultures while celebrating harmony in diversity. The WCF-World Pavilions beautifully situated in the green fields around the stadium will showcase in four pavilions the world continents cultural heritage by allowing participants to experience the typical food, dance, literature and music of Africa, Asia-Pacific, Europe and the Americas. The pavilions will also host the 5th International Women's Conference, a World Youth Conference and Conference on Living Human Values. Senior governmental representatives, business leaders, academia, leaders of NGOs, religious and spiritual leaders, peacemakers and renowned personalities from across the globe will exchange their views and spread the message of peace, unity and harmony in diversity. The World Pavilions will also host an exquisite international vegetarian food festival, allowing participants to taste the cuisine of all continents. The World Culture Festival will furthermore share the vast cultural heritage of India, the source of yoga, not only by showcasing the benefits of yoga, but also by sharing the beauty and depth of the music, dance and the cuisine of India. Up to 5000 guests, including artists and distinguished delegates from public and private sector, are expected to travel from India to Berlin. The WCF-Yoga Park will allow participants to experience the powerful impact of Yoga as a way to improve physical and mental health as well as to create inner peace. 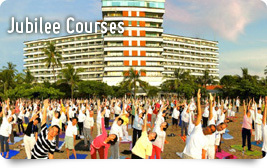 Yoga experts of all different traditions will share their expertise in conferences and workshops. A unique Yoga Museum will chart the evolution of Yoga from ancient sages to its global application in the 21st century. The Yoga Park will also illustrate the societal impact of Yoga in peace building and therefore its application in humanitarian projects around the world. Leading dance and music troops from around the globe will mesmerize the audience with dazzling performances. The Grand finale will see an unparalleled concert with 30 pianos and 2000 guitars as well as a Peace Meditation. Welcome to Berlin! Welcome to an unforgettable celebration!